Market Development Funds (MDF) is a part of the Partner Channel Management scenario in the SAP CRM solution. In this scenario the channel manager (brand owner, for example a consumer electronics company) and the channel partners (resellers or distributors) work together to generate additional customer demand. There is detailed information on MDF available on help.sap.com. However, there is very little documentation available on how the MDF solution looks in the SAP CRM system. This blogs shows the main MDF functionality in the system. Market Development Funds are funds (budgets) that the brand owner provides to the resellers to execute marketing activities, for example advertisements, trade shows or email campaigns. The MDF solution enables the brand owner to better manage the administration, distribution and consumption of funds for resellers. The standard business role CHM-CM Channel Manager gives access to the MDF functionality. The brand owner can create Funds Plans to group funds by purpose and organizational unit. The fund plan can have a fixed (date) or relative (number of periods) expiration period, a currency and a status. Then the brand owner can create Funds for specific accounts, products, product categories, product groups or territories, and assign them to funds plans. The fund has an employee responsible and a status. Funds are containers for budgets. The brand owner can manage fund budgets through Budget Postings. This can be a budget update, transfer, extension or renewal. The budget posting has a currency, posting date and status. An MDF program can span over several years and can be assigned to a marketing organization and employee responsible. The channel partners and fund plans are assigned to the MDF program. It is also possible to assign Initiative Templates to the MDF program. These templates can be used by the brand owner or channel partner to easily create initiatives from template values. The brand owner and reseller can agree on marketing activities to be executed by the reseller. These activities can be captured in Initiatives. It is possible to create the initiative from an earlier created initiative template or without template. One or more expense types with the estimated cost, the sales area and the claiming period are assigned to the initiative. Once the initiative is approved the reseller can claim on the initiative or the channel partner can create a Claim for the initiative on behalf of the reseller. It is also possible to create a claim without reference to an initiative; this is called a Direct Payment. 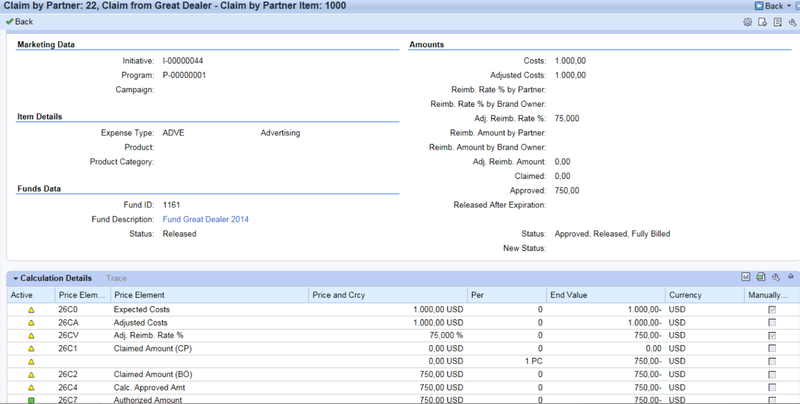 In the claim the channel partner is captured and the fund plan and fund is determined or entered. One or multiple Resolution (claim) items based on Expense Type can be entered. For each claim item the Cost, Adjusted Reimbursement Rate % or Amount and Approved Amount are entered. The calculation of the Authorized Amount is done through a pricing procedure with pricing conditions. Each claim item has to be approved before the claim can be settled. The approved claim items can be settled from the Claim Settlement Due List. 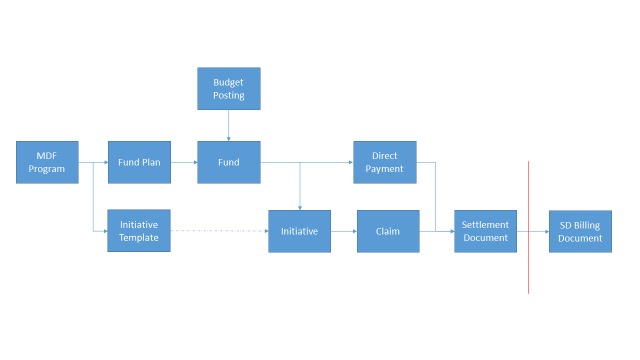 The created billing document (claim settlement) can be Transferred to Accounting (FI-AP). It is also possible to transfer claim settlements as billing documents to SD billing in SAP ERP. From there they can be further processed to financial accounting. To support this scenario you have to activate business function Claims and Funds Management (CRM_CF_1) in CRM and business function ERP Integration with Claims and Funds Management (ERP_CF_INTEGRATION_1) in ERP, available as of SAP ERP 6.0 Ehp5.